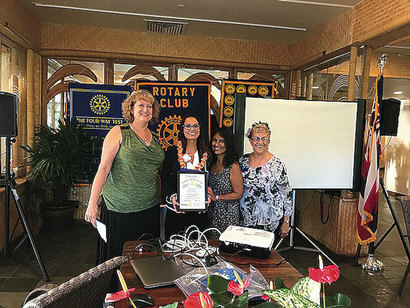 Michelle Baliguat was inducted into the Rotary Club of Lahaina Sunset on August 29th. Michelle is a native Hawaiian born in Ewa Beach Oahu. She has lived in 6 states in the U.S. and recently relocated to Maui. She received her Associates of Applied Science Degree in Culinary Management in 2012. She worked in the hospitality industry for over 20 years before deciding to change careers and start working for Ben Bridge Jewelers. Ben Bridge Jewelers was established in 1912 in Seattle Washington and is still family owned and operated to this day. There are over 50 Ben Bridge Jewelers Stores and 43 Pandora Stores that are owned and operated by Ben Bridge. She was previously managing the Downtown Pandora store in Portland before transferring back home to Maui in 2016. She received her Accredited Jewelers License in 2015 and has recently achieved her Registered Jewelers License in July 2017. She has friends and family that have been a part of Rotary for many years and is very excited to finally find a Club that is as passionate about helping the community as she is. Michelle’s sponsor is Joanne Laird.